Guest post by Deepika Vasudevan. #TAGC16 Shorts are brief summaries of presentations at The Allied Genetics Conference, a combined meeting of seven genetics research communities held July 13-17, 2016 in Orlando, Florida. The microbes in our guts seem to affect almost every aspect of human health, from the obvious (e.g. metabolism1) to the unexpected (e.g. behavior2). Several of these paradigms have stemmed from studies in model organisms that have been later validated in humans. This year, The Allied Genetics Conference featured a workshop on the gut microbiota of the fruit fly, Drosophila. One interesting study presented in the session revealed that the gut microbiota alters host alcohol metabolism and sensitivity. 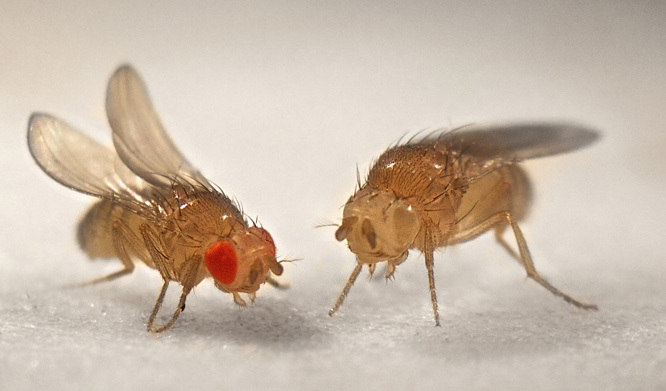 Results presented by Malachi Blundon, a graduate student in the McCartney and Minden laboratories at Carnegie Mellon University, showed that “germ-free” flies, which lack a microbiota, have decreased sensitivity and increased tolerance to alcohol. Alcohol sensitivity and tolerance in humans and Drosophila is controlled in part by the enzyme Alcohol Dehydrogenase (ADH), which metabolizes potentially harmful alcohols into useful aldehydes. Human ADH mutations, commonly found in Eastern Asian populations, decrease both alcohol tolerance and the risk of dependence. Furthermore, people with alcoholism have been reported to have an altered microbiota. The causal relationship between this “dysbiosis” and alcoholism is unknown. Blundon and his colleagues found that germ-free flies have a higher level of ADH in their heads compared to control flies. Without their gut microbiota, the flies remained mobile significantly longer after exposure to ethanol vapor, and were less likely to die after repeated alcohol exposure. When germ-free flies had their microbiome restored, their ethanol sensitivity returned to levels similar to the control group. 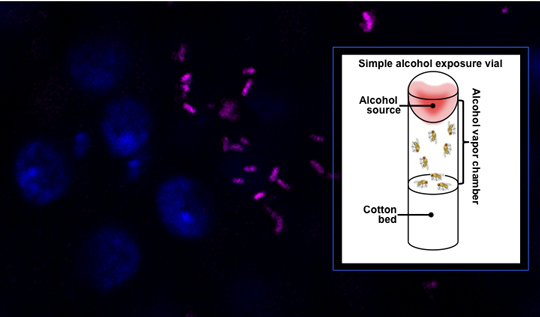 Ongoing studies in their lab include examining whether the microbiota also affects alcohol preference in Drosophila and identifying the specific microbe that mediates the alcohol response. Blundon hopes these studies will provide insight into the possible roles that the microbiota have on alcohol metabolism and alcohol abuse disorders. Drosophila gut stained for Lactobacillus brevis (magenta) using fluorescent in situ hybridization (FISH), and for gut cell nuclei (blue). A type of simple alcohol exposure chamber can be used to test for alcohol sensitivity and tolerance in Drosophila. Images courtesy of Scott Keith and Malachi Blundon, McCartney Lab, Carnegie Mellon University. Mikkelsen, K. H., Allin, K. H. & Knop, F. K. Effect of antibiotics on gut microbiota, glucose metabolism and body weight regulation: a review of the literature. Diabetes Obes Metab 18, 444–453 (2016). 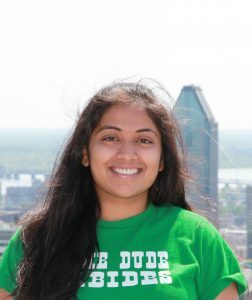 About the author: Deepika Vasudevan is a postdoctoral researcher at NYU Medical Center who uses Drosophila to understand the effects of physiological stress on innate immunity, lifespan, and more. Follow her stream of scientific consciousness on Twitter @dvasudevan.